I was really excited to start my photography class last night. I think that I am a person who could just be a perpetual student. I felt more than a little old as I walked in with all the art students who were walking around with their portfolios. And then I felt even older as I was one of the only ones who didn’t even know how to open the beautiful Macbook Pro sitting in front of me. But I got over myself quickly in order to keep up and asked for help! I learned so much in three hours about manual shooting and am looking forward to getting those 35-75 pictures for next week’s class. And a little reading to catch up with the rest of them. Assignment is portrait pictures so I will let you see some of them at the end of the week. Am working hard on my little quilt for Project Hope. I used some flannels from my stash and foolishly tried fusible batting. I have never used it on a a large project before and will never do that again on a large piece. It was way too stiff with my little machine. So in an attempt to save time, it probably cost me an hour to start over with the batting. Looks like it will be nice and warm. It turned out to be 45 x 65. At least now I know that I should have cleaned out some of my background distraction before I showed you this picture-I’ll progress I guess. Happy sewing my friends. 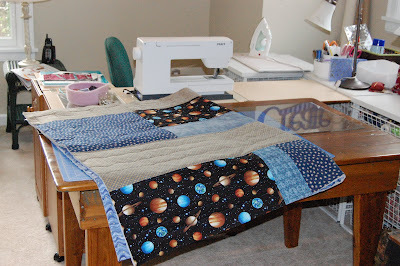 This entry was posted in charity quilts 2009 on November 4, 2009 by Colleen Kole.